It takes one vertical songwriter to dig deep into the soul of another. Britt Nicole serves as our latest interviewer as CMCentral recently asked various artists to interview one another. Britt’s subject? 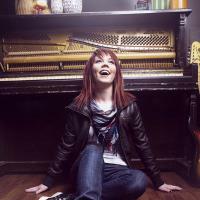 New worship artist Sarah Reeves. Here’s a closer look at an artist completely focused on the heart and glory of God. Britt Nicole: When did you know you were called to do music? Sarah Reeves: I always imagined making music for a living as a child. The moment when God called me to be a worship leader at age 15 was when I really became serious about it. Thinking I would always be a rock star, God humbled me quickly and turned my world upside down at a youth camp I was attending. There, He called me to be a worship leader and immediately opened doors for me to usher people into His presence. Britt: I know you are a worship artist. How do you define worship? Sarah: I once heard someone say the definition of worship is simply our response to how awesome we think God is. It is more than just a song; it is a lifestyle. It is what we say and how we think. Through our daily actions, we can worship God by honoring Him with our lives. Britt: I love your songwriting. What was the name of your first song, and what was the inspiration behind the song? Sarah: My first song was called “Fly with Jesus.” It was birthed out of a tragedy when I was 15. One of my very best friends had a sudden brain aneurysm and died in his sleep. It was one of the hardest things I’ve ever had to go through. I didn’t know how to handle my emotions and pain, so the first thing I did was sit down at my piano, grabbed a piece of paper and wrote this song in about 20 minutes. I ended up entering that song into a fine arts competition. I did well in the competition, and from then on knew that songwriting was a gift that God had birthed inside of me. Britt: What is your favorite song on the new record and why? Sarah: One of my favorites on the record is “Come Save.” It’s my heart’s cry for this world. 2 Chronicles 7:14 says, “If my people who are called by my name will humble themselves and pray and seek my face and turn from their wicked ways, then I will hear from Heaven and will forgive their sin and heal their land.” I stand on that promise as I pray—that we will humble ourselves before Him and turn from our sins. Britt: What advice would you give someone who wants to be a worship leader? Sarah: Matthew 6:33 says, “Seek first the Kingdom of God and all His righteousness, and all these things will be added unto you.” As a worship leader, it’s easy to get caught up in worshipping the worship instead of worshipping God. It’s easy to get frustrated and discouraged when all you get is crossed arms and blank stares. It’s even easy getting caught up in the ministry of being a worship leader. While worship and ministry are both obviously important, be careful to keep your eyes on the Giver of your gift, and know that if it’s His will for you to be a worship leader, He will anoint you to do so. Even when a crowd seems like they are not responsive, do not be discouraged. Keep worshipping and seeking after the heart of God above all things. Remember that a worship leader is a full time job—not just on stage, but off stage as well. Lead a lifestyle of worship and be an example to others through the way you live, not just in a service. Britt: What is your favorite thing to do besides music? Sarah: I love just being with my family and friends, having fun and laughing a lot. Britt: I know you lead worship at your home church. What is it like to have such a big family of support behind you? Sarah: It’s great to have my church family behind me. They are such a blessing, and it’s awesome to see my youth group growing and falling more in love with Jesus as I see them every Thursday night where I lead worship. Britt: What is your mission as an artist? Sarah: My mission is to bring freedom to this world, to bring life to those who are spiritually dead and to draw those who love God into a deeper and more intimate relationship with Him. We as Christians have lost the awareness of the power of God. We have put Him in a box and have forgotten how big and awesome He truly is. My mission is to be a vessel for Him and remind every heart that He is the God of the impossible. Britt: Do you ever feel pressured to fit into a mold, or has it been easy to stay true to who you are? Sarah: There have definitely been times where I have felt pressured, but God has lifted me up and has been my strength in times of weakness. As long as I am close to Him and in the Word daily, it is not hard to be true to who I am in Jesus. For more info on Britt Nicole, visit myspace.com/brittnicolemusic. For more info on Sarah Reeves, visit myspace.com/sarahreevesmusic. **This interview first published on July 23, 2009.